“Jerusalem is not for sale, and the Palestinian people’s rights are not up for bargaining,” Abbas said as he opened his speech. The Palestinian leader said that Trump has undercut the peace process by recognizing Jerusalem in December 2017. The Palestinians have boycotted talks with the Trump administration over the last year as a result of the Jerusalem recognition. At the same time, Trump has retaliated on his own, cutting funding to UNRWA, the U.N. agency that handles Palestinian refugees, as well as direct funding to the P.A. and shuttering the Palestine Liberation Organization’s mission in Washington, D.C. 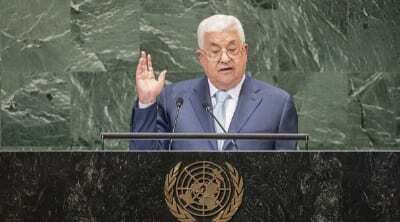 The Palestinian leader also took aim at Israel, calling the recently passed nation-state law “racist,” and saying it will create an “apartheid state” that will diminish hopes for a two-state solution. He also declared that Palestinians “never use violence,” in contrast to Israeli settlers. The United States and Israel have both passed legislation this year that deducts monies to the P.A. for its support of terrorists and their families. After Abbas’s speech at the General Assembly, Israel’s ambassador to the U.N. Danny Danon said: “Abu Mazen [Abbas] knows only one word ‘no’- not ‘direct negotiations’, not ‘Israel’, not the ‘Americans.’ On one hand he brings imaginary initiatives to the U.N., and with the other he pays millions of dollars to terrorists. Abu Mazen must understand that if there will be negotiations, it can only be directly with Israel, and not through speeches at the U.N.